HowToRepairGuide.com: How to remove seat on 2006 Zongshen Sierra 200? The Zongshen Sierra 200 also closely imitates both the instrument cluster and the wiring system of the Yamaha TW200. The Sierra 200 speedometer is the same size and shape as the Yamaha speedometer, as is the instrument light cluster. Also, the electrical wiring diagrams of both motorcycles appear very similar. However, there are some minor differences. For example, the Yamaha TW200 also employs its front turn signals as running lights; the Zongshen does not. 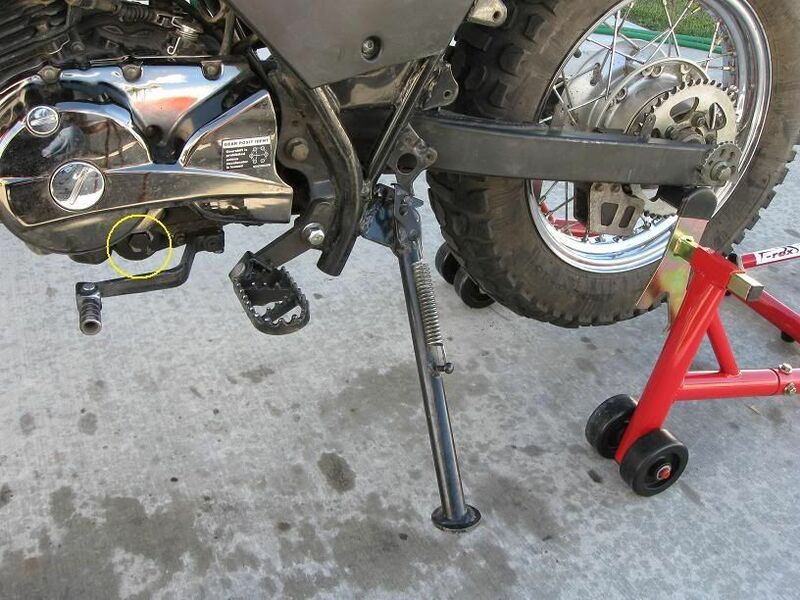 Therefore, the TW200 has three wires going into the front turn signals, instead of two. Like most other Chinabikes, the Sierra 200 employs a BA20D headlamp bulb; the TW200 uses an H4 headlamp bulb. In another, minor variation, the two motorcycles use a different color code for their wiring systems. However, given the many similarities between the two electrical systems, it seems reasonable that many electrical components should be interchangeable. All factors considered, I am very happy with my 2006 Zongshen Sierra 200. The positive cable for the battery was too short, I had to buy a cable extension for the cable to reach the terminal. The battery also sits high and creates a small gap under seat. 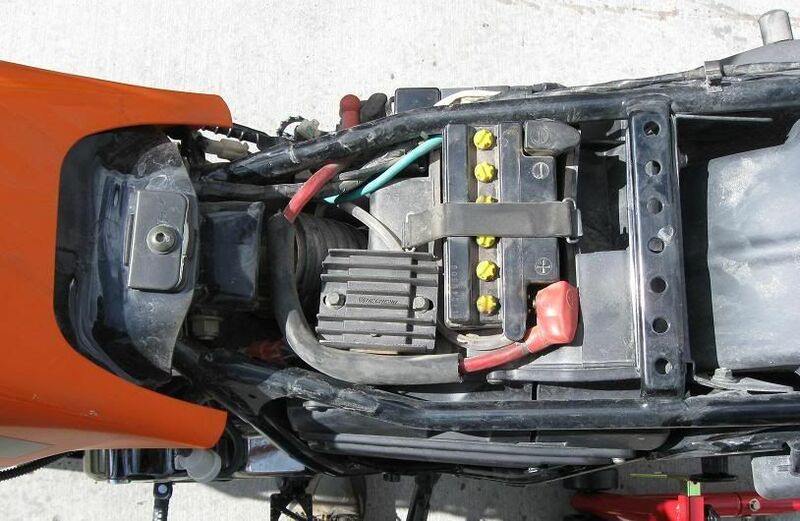 The YB7C-A battery used in the TW200 has the overflow vent on the left side with the battery terminals forward. 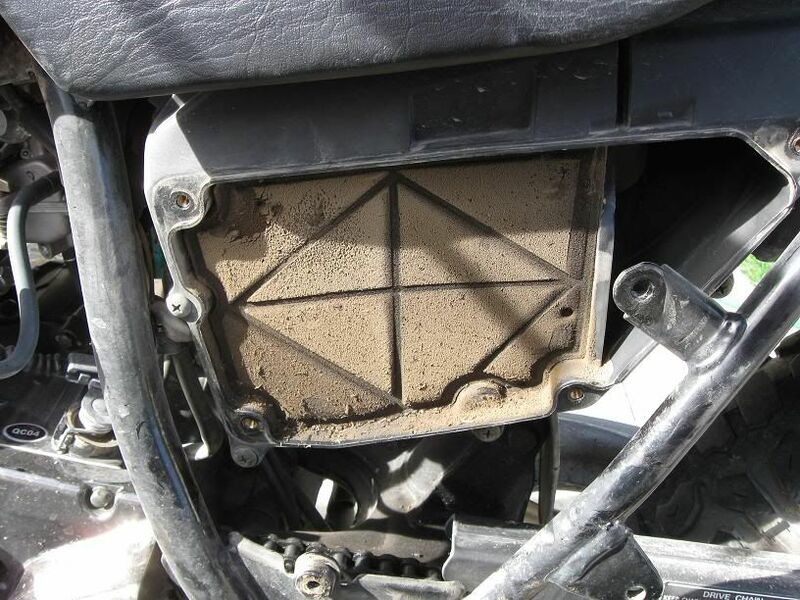 The overflow vent must be on the left side, or the seat will not fit on either motorcycle. 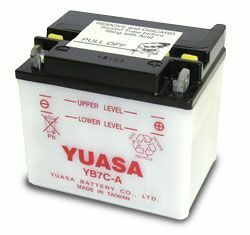 Therefore, 200GY-2 owners need to place the Yuasa YB7-A with the battery terminals aft, and this requires the longer positive battery cable. The YB7-A that came with my Zong is an excellent battery, and I am sure it will last a long time with proper care. However, the YB7C-A battery is 17mm shorter in height, which makes it much easier to replace the removed seat on the motorcycle. Therefore, when I need to replace my Zong battery, I will probably choose the YB7C-A model used by the Yamaha TW200. If you want to learn more about battery options for your Zongshen 200GY-2, do a search over at the TW200 forum. You can learn a lot about your Zongshen 200GY-2 motorcycle by reading about and researching the Yamaha TW200. Pull lever on right or left side, up under the seat. It can also be at the rear of the seat, right or left side, again up under the seat. Lift seat off up and to the rear. Sometimes it's hooked on both sides with a rod or cable connecting both sides. These can break. Make sure both are unhooking. Sometimes, there is a spring...it can stretch and/or break too ! Nuts or bolts, at the rear and below seat, under the rear fender Remove 2-4 bolts holding down the rear seat ( Pinion seat ). Remove seat and then remove two bolts, at the rear, holding the front seat on. Push button on side. Left side, I haven't found a push button on the right side... yet ! Can be locked or unlocked with a key. 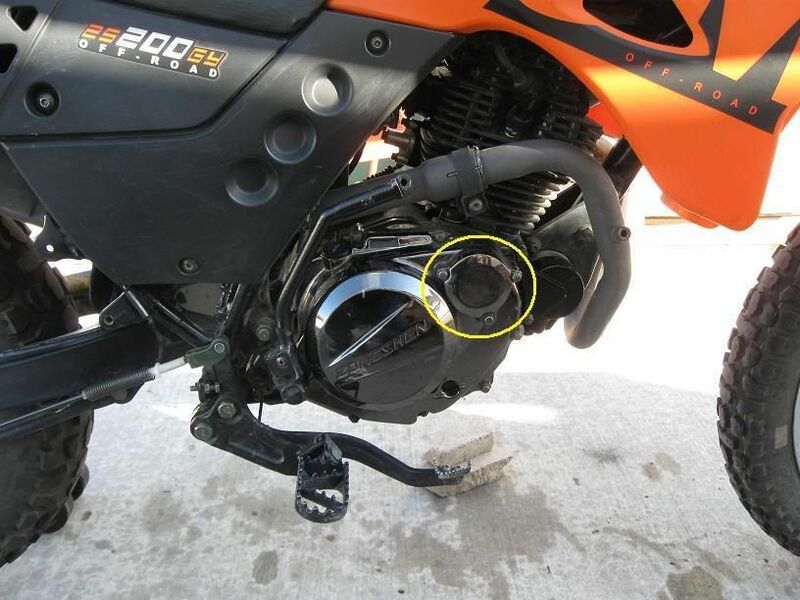 Here is the location of the Zongshen’s oil drain plug. 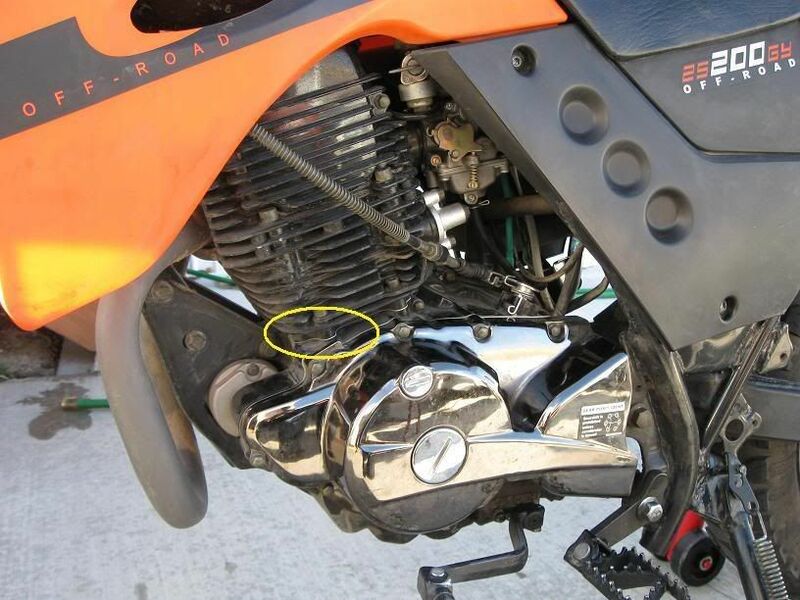 The Zong’s oil filter cover is located here. Always check for oil leaks at the cylinder head base gasket, located here. Finally, it is very important to always use the correct oil filter with four holes in the end! 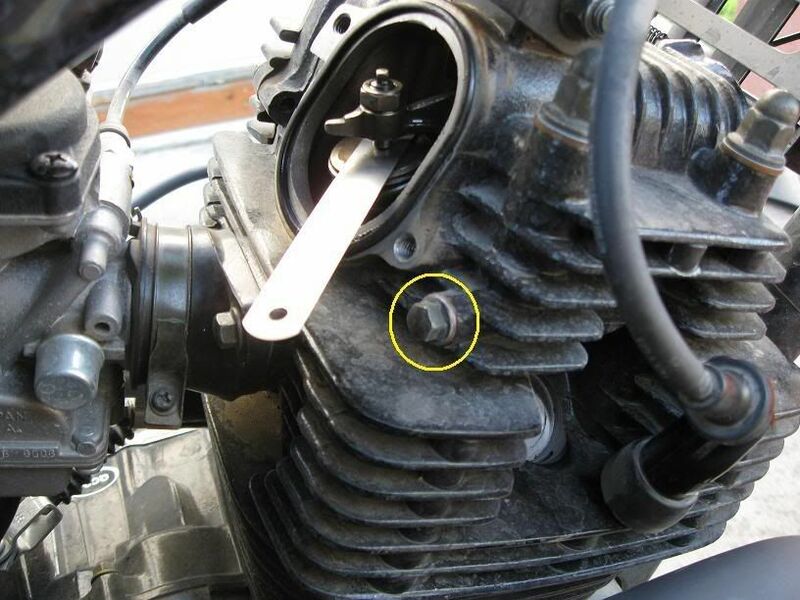 After the new oil is added, start up your engine and slightly loosen the bolt shown below to check for oil flow to the top of the cylinder head. This procedure will verify that you have the correct oil filter, and it ensures that the camshaft, valve rockers and valve tappets are being lubricated in the cylinder head! I discovered the Hyosung GF125 Service Manual. This manual contains information on the Sierra 200 front brake caliper following page 6-22. Yamaha Mexico’s web site with PDF parts catalogs for the TW200, model years 1994-2001, 2003 and 2008. Labels: How to remove seat on 2006 Zongshen Sierra 200.